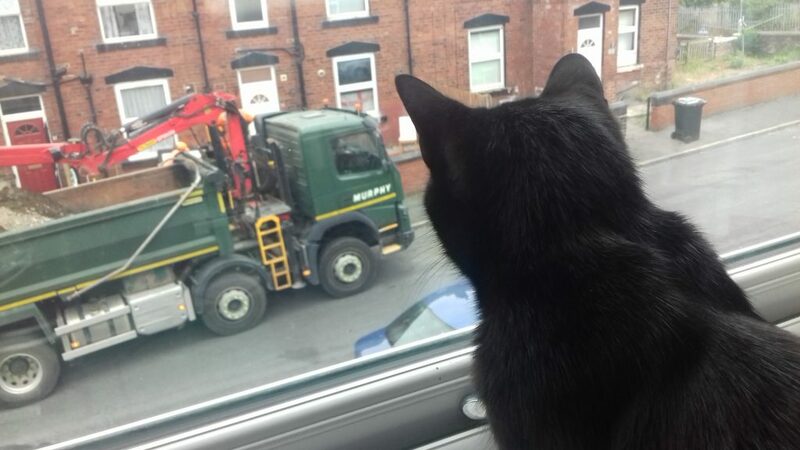 I haven’t done an Elmo post in ages, so here he is, watching a truck from the office window. I haven’t seen much of him recently, as he’s usually out enjoying the summer weather. It always feels weird to wish for cooler weather when you live in England, but I’m looking forward to him being at home more. The writer’s life can be a lonely one (plays smallest violin, gets back to decadent life of sitting around working at home). Merry Christmas from Chez Knighton! 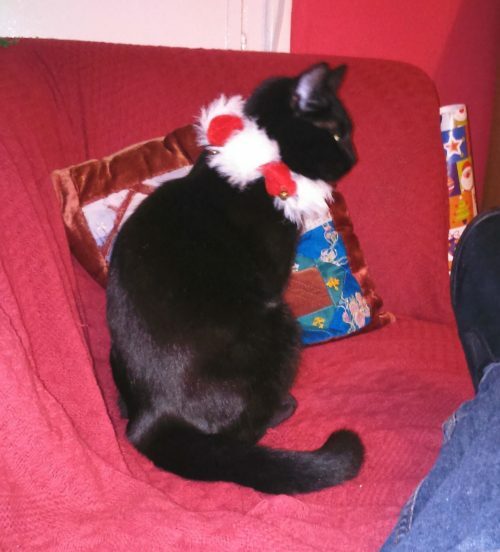 I hope you’re having at least as much fun as Elmo is having with his Christmas collar. He’s learnt to catch mice, which is good, as it turned out some were living in the kitchen. He’s made friends with other cats in the street, which is a relief after the fights and face-offs at our last house. He’s calmed the f**k down, which makes my life easier. 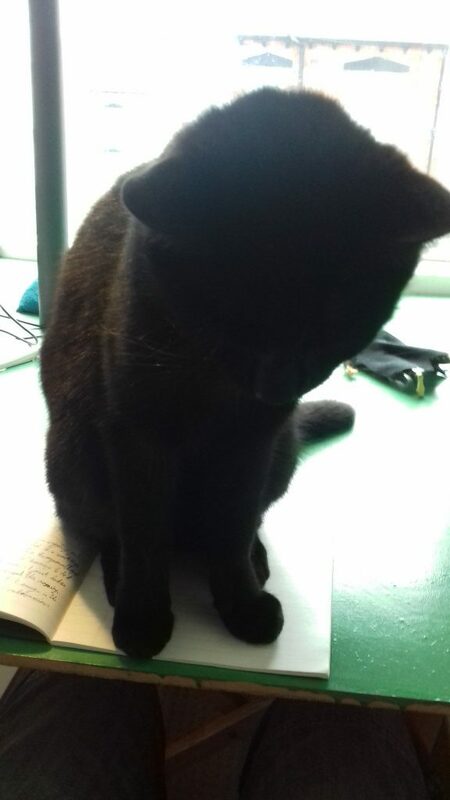 Now he can entertain himself by running around the allotments, he hardly ever ambushes me on the stairs or wakes me up to play at three in the morning. I almost miss those crazy days. So well done Elmo. Treats all round. And maybe next year you can learn that the sink and the toilet aren’t good places for you to drink from. 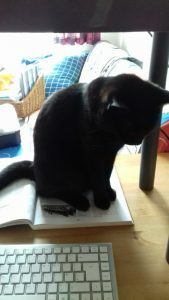 It’s been a while since I’ve written an update on where I am writing-wise. So, for those who are interested, and to keep myself honest, here it is. As I mentioned around the start of the year, life descended into chaos in the last few months of 2015, and I fell way behind where I wanted to be. 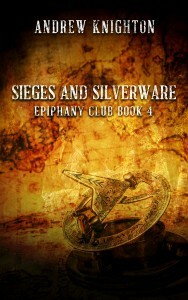 Now that I’m back on top of life, I’m trying to crack on with self-publishing again. I hope to put out a new e-book of some sort roughly every two months. A Mosaic of Stars was meant to be the February release, but ended up being a few days late. I’m aiming to put out a short story set in medieval England as a free e-book in April – all that’s needed at this point is the edits. 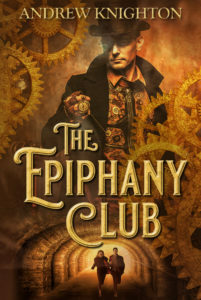 Meanwhile, I’ll get back to writing the long-delayed parts four and five of the Epiphany Club steampunk series, the next two releases. I have plans beyond that, but let’s not get ahead of ourselves. Meanwhile, I’ve started submitting short stories to websites and magazines again. I’ve had one accepted for an anthology from the publishers of Avast! Ye Airships. Hopefully more will follow – watch this space. I have enough work to live off for the next few months, and it’s all interesting. Some ghost written fiction, some writing about writing, and a load of military history. Writing things I enjoy is very motivating. Clients have started approaching me rather than me always chasing them. So far that’s mostly been with work I don’t want, but hey, it’s a step forward. The more experience and reputation I build up, the more work I get offered, and the better it is. Now I’m hitting my deadlines again, I can start to build up a financial buffer to take time off for my own writing. I’m currently writing each week’s set of blog posts eight days before the first one will go out. That relieves the pressure I felt when I was writing each one the day it went out, or even writing a weekly batch just before the first one appeared. It makes the content a little less timely, but provides me with prepared posts in case something gets in the way of writing. And I can always juggle the schedule if something comes up I want to respond to quickly. So again, things are going pretty well. My able assistant Elmo the kitten is now six months old, and I’m not sure I can call him a kitten any more. Certainly not to his face. 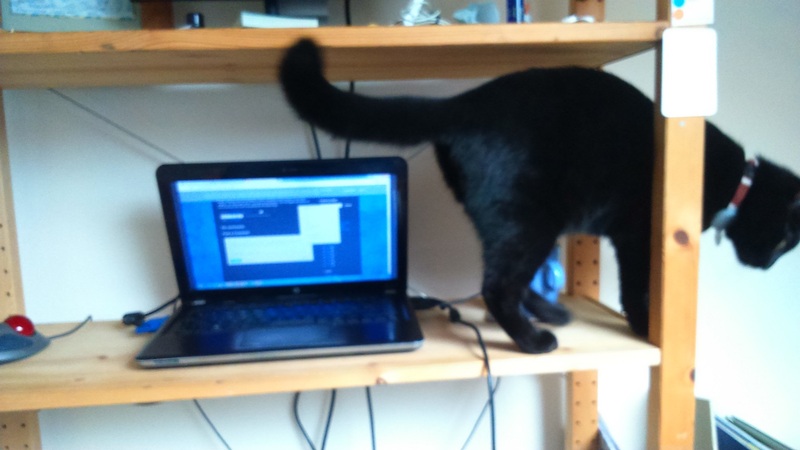 He still keeps trying to play with the keyboard, but doesn’t persist for long because he knows I’ll stop him. 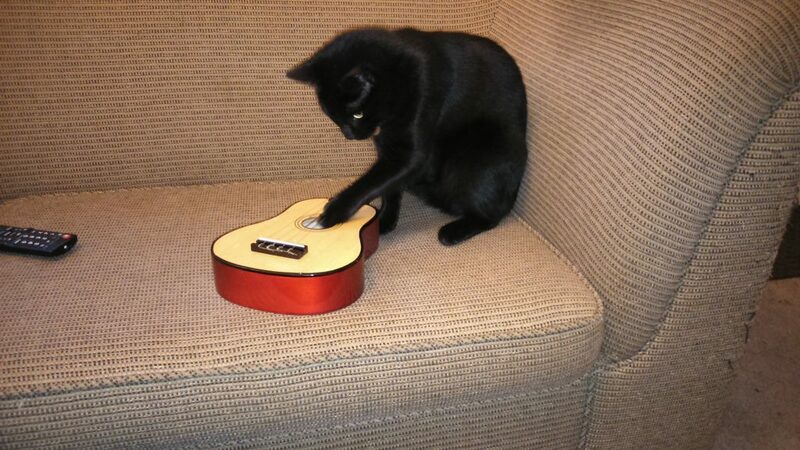 He’s a mad little beast, but is at least learning not to bring his claws out when we play. That’s about it – the start of play for Andrew Knighton, writer, as of mid March 2016. Here’s hoping things keep on improving. Happy New Year, and all that jazz! This is just a quick update for those who read my blog regularly. First, I’m sorry for suddenly going silent in mid-December. I moved house just before Christmas, and in the middle of that a major change took place in my personal life. Add the inevitable chaos of the festive season, and I completely ran out of mental energy. Suffering from depression, I’m prone to this at the best of times, and this December was far from the best of times. Fortunately, I have a lot of great people around me, and they helped me through. I’m now nicely settled in my new house, which includes an awesome writing space I’ll blog about soon. 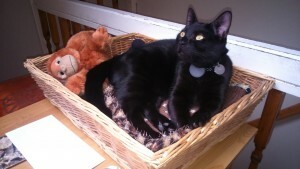 Elmo the kitten is growing up fast and is now fully cat shaped, though not fully cat sized. I’m having to completely reset my work goals, but at least now I might manage to meet them. Regular blogging should be back at the end of this week, including the weekly stories. In the meantime, I hope you had a great time over the holidays. As my friend Si says, here’s to an average year – better than the last one, but with an even better one to follow.